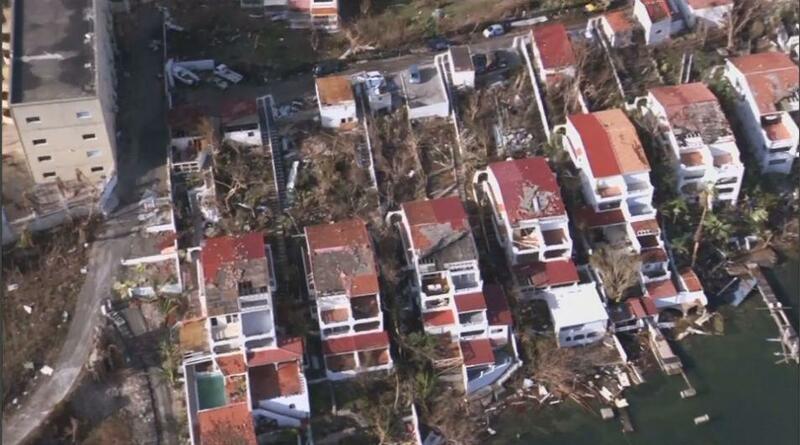 Nearly one third of the buildings in the Dutch-ruled section of storm-battered St. Martin have been destroyed, the Dutch Red Cross said Tuesday. More than 90 percent of the structures on the island were damaged in Hurricane Irma. The Dutch Red Cross made the assessment based on photographs provided by the Defense Ministry in the Netherlands, as well as a survey of 5,500 structures before the storm. Hurricane Irma was one of the strongest storms ever recorded, but for many residents, the aftermath was even more menacing. American Susan Coquin, who found a spot on a charter flight back to the U.S. after sheltering in Puerto Rico, is one of the many who lost nearly everything. "Went through the storm, got looted and robbed. My place blew up. Forty years of my life was here," Coquin said. Dutch King Willem-Alexander visited his country's part of the island and said the scenes of devastation he witnessed were the worst he'd ever seen. In images broadcast by Dutch national network NOS, Willem-Alexander said he'd seen a lot of war zones in his life but never anything like this. St. Martin is an island shared between a French territory and the former Dutch colony of St. Maarten, a largely autonomous part of the Dutch kingdom with a population of around 40,000.